Left hanging. What ingredients and process? Thanks. Puckjam wrote: Left hanging. What ingredients and process? Thanks. Post #9 on the previous page. 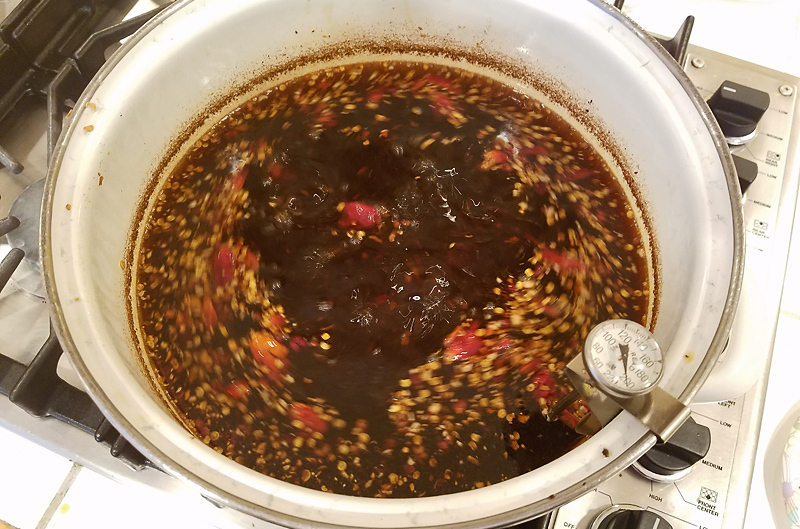 I've had a few requests for my Chili Oil lately which prompted me to check this thread and realize I've updated my recipe/technique a bit. Plus its now more standard recipe friendly. Included is a 6X batch, which is what I typically make. What follows morphed from a recipe in China Moon Cookbook by the incredible Barbara Tropp (RIP). Complex, flavorful with noticeable heat use as both a condiment and ingredient. Drizzled on morning eggs, in mayonnaise or BBQ mops and the solids that sink to the bottom add texture, flavor and heat to everything from noodles, salads and marinades. 1. Combine all of the ingredients in a heavy, non-aluminum 3-quart saucepan. Rest a deep-fry thermometer on the rim of the pot. Over moderately low heat bring the mixture to 225 stir almost constantly. Gently simmer for 30-40 minutes, checking to ensure the temperature does not rise. Remove from the heat* and let stand until cool or overnight. May be stored at room temperature, I store in refrigerator. It is best to use a deep-fry or candy thermometer as oil temperature is hard to judge and will burn quite easily. * Oil is done when garlic starts to turn light brown. 1. Combine all of the ingredients in a heavy, non-aluminum 8-quart saucepan. Rest a deep-fry thermometer on the rim of the pot. Over moderately low heat bring the mixture to 225 stir almost constantly. Gently simmer for 30-40 minutes, checking to ensure the temperature does not rise. Remove from the heat* and let stand until cool or overnight. * Oil is done when garlic turns light brown. Of course you do . Most people would think, maybe I'll double a hot chili oil receipe, maybe even triple it. But, this is what separates you the the rest of us mortals. Chile Oil - 6x batch in motion! It took about an hour in total, over medium-low heat, to bring this pot of oil up from room temperature to 225F for the desired length of time. And because I had some really fiery ones on-hand, I subbed in 1 cup of Tien Tsin Chile Peppers for 1 of the cups of red chile flakes. Those are the brighter red flecks you can see in the picture. By the time the oil was done cooking, they had assimilated nicely into the monochromatic mass. Of course, I included the optional Szechuan peppercorns, too. And fwiw, I pegged the weight of 30 cloves of garlic to be approximately 115g. I am wondering if this recipe can be adapted for the slow cook setting on the instapot. Any ideas here? toria wrote: I am wondering if this recipe can be adapted for the slow cook setting on the instapot. Any ideas here? no reason it couldn't work, right? I think it would work its just a question of how long you would cook it on the slow setting. Two hours? Four hours? My, note I say my, meaning my version of this process, uses visual clues, The slow bubbling of the oil, the color of the garlic as it slowly turns toasty, watching the bubbles break the surface, the fewer the bubbles the more the moisture is being cooked off. Also, for best results one needs to keep the oil in motion, especially with larger batches lest the bottom burn, which will also give off its own signals. This is a mildly time consuming temperature sensitive recipe to make right, you can't really walk away from the stove, you need to stir, smell, taste, watch, listen, feel for the resistance of the spoon as viscosity changes. What I sometimes refer to as 5-senses cooking. You wanna use an instapot, go ahead, god bless. Just don't grouse at me when its not the same as outlined. Last edited by G Wiv on July 12th, 2018, 3:55 pm, edited 2 times in total. ronnie_suburban wrote: Chile Oil - 6x batch in motion! Tnx so much for publishing the updated recipe. I'm going to make it this week. I've just lately gotten all the ingredients (chiles, peppercorns, black beans) from Mala Market--their stuff is simply outstanding in freshness and authenticity. Geo wrote: I've just lately gotten all the ingredients (chiles, peppercorns, black beans) from Mala Market--their stuff is simply outstanding in freshness and authenticity. Nice! Never ordered from Mala Market but dig both the blog and instagram. Why should you never order from them? dradeli wrote: Why should you never order from them? I don't think anyone said that. Gary said that he *hadn't* ordered from them, not that he *shouldn't*--if that's what you're referring to. Mala Market? I absolutely would order from Mala Market but see no need as I can easily source locally. If the products are curated as carefully as the blog, Instagram and recipes I'd guess they are first rate. Wondering if you would be willing to share your source for chili pepper flakes? Just made a 1X batch of this oil - which is great - but it could have a bit more heat. I think perhaps the chili pepper flakes I used were not as hot and as fresh as can be found. The best you can get are from the Mala Market online. Trust me on this! Thanks. Yes, I saw the earlier post. Looks great. It does appear that they are sold out of the ground peppers. The Mala Market site also has an article explaining that they are now importing 3-year aged Pixian doubanjiang. Their green Sichuan peppercorns are freakin' *dynamite*, incredible. Recommended totally. Further to the idea of cooking popcorn in chili oil - roasted some pumpkin seeds last night with some chili oil. This works well also. bw77 wrote: Further to the idea of cooking popcorn in chili oil - roasted some pumpkin seeds last night with some chili oil. This works well also. Great idea, as my bride came home from an Alzheimer's walk yesterday with a large pumpkin, I see this in the near future. Should have mentioned it earlier, ronnie_suburban gifted me a jar of the chili oil he made from my 6X recipe up-thread, spot-on! Thanks Ronnie! Made a batch which we are putting in small Ball jars to give away as gifts. Fa, la, la, ma la, la, la, ma la! The "Godmother's" chili with black beans, as per Woks for Life, is pretty terrific, too. Try it on vanilla ice cream. My wife hated it with a passion that consumed her soul but I'm fully on board with chili crisp sundaes.